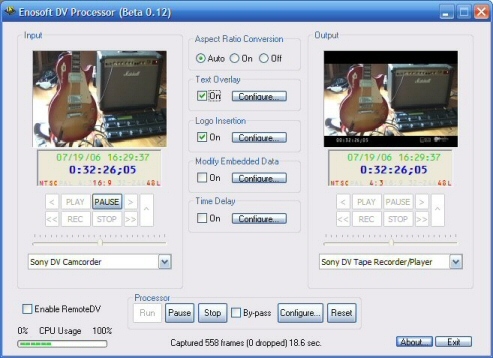 Enosoft DV Processor is designed to perform real time processing on DV streams, either from an attached DV device or from existing DV AVI files and outputted to another attached DV device, a new DV AVI file or onto the computer's display. Enosoft DV Processor is designed to perform real time processing on DV streams, either from an attached DV device or from existing DV AVI files. The processed DV streams can be sent to another attached DV device, a new DV AVI file or onto the computer's display. The key functions range from the relatively mundane - capture DV, send existing DV files back to a device etc - to real time logo insertion, aspect ratio conversion, timecode burn-in and synchronous control/capture from devices connected to separate computers on a local network. Free for personal use. $129 (US) introductory price for commercial use. Fixed bug in automation interface for changing embedded time/date with the emSpecified option.